The Environmental Protection Agency had barely started its five hours of public testimony in Anchorage before 100 people signed up to speak on the proposed limits to the Pebble Mine project. The restrictions were offered last month, and they would effectively prevent the controversial mine from being built under the Clean Water Act. Because the Pebble Project has not yet applied for a permit, the determination was made based on studies of comparable mines. Such a preemptive decision is highly unusual for the agency, and a large crowd packed mostly with activists wearing “No Pebble” stickers showed up to offer public comment. 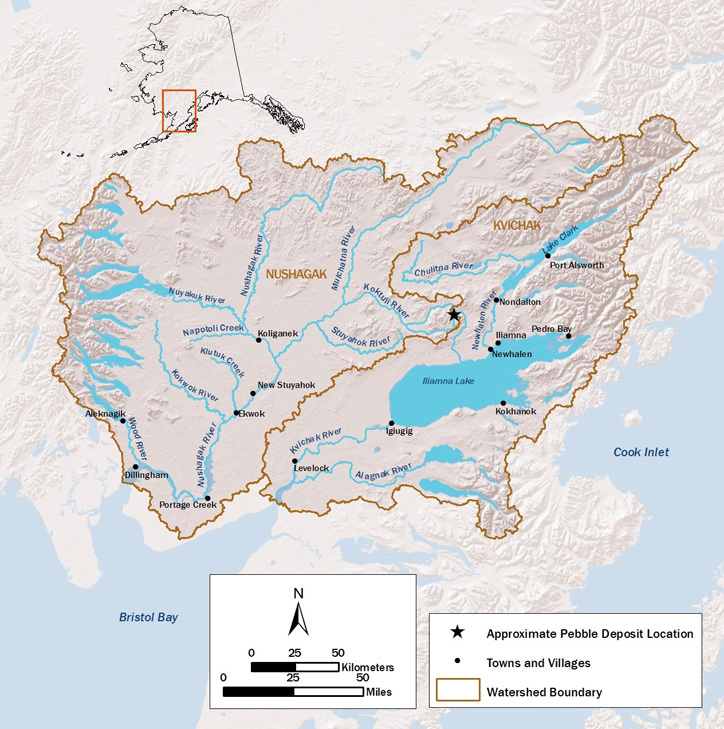 While the EPA was primarily there to listen, regional administrator Dennis McLerran also justified the decision to block a large-scale mine in the Bristol Bay region. “We find that even a mine of .25 billion tons – the median size of the world’s porphyry copper mines but only an eighth of the smallest mine size contemplated by Northern Dynasty Minerals at the Pebble site – would exceed the following unacceptable effects: loss of streams, the loss of five or miles of streams of documented salmon occurrence,” says McLerran. McLerran described the Bristol Bay salmon fishery as an “extraordinary” resource that merits protection from the risk of a mining disaster. Tom Collier the CEO of Pebble Mine was the first person to give public testimony, and he was allowed five minutes to speak. He accused the EPA of restricting the Pebble project based on a “fantasy mine” scenario. “We think there’s a process that the statute outlines for that, and you are keeping us from being able to take advantage of that process,” said Collier. Collier also expressed concern over the breach of the Mount Polley tailings dam, but asked that the audience avoid “jumping to conclusions” over what the failure should mean for the mining industry. If developed, the Pebble project would be one of the largest open-pit mines in the world. The value of the mine is estimated at $300 billion. Native groups and commercial fishermen have come out against it, arguing that it could jeopardize the largest sockeye salmon run in the world. EPA officials will be traveling to a half dozen villages in the Bristol Bay region later this week to hear more public testimony. The agency will be take written comment on the project through September 19.